TUCSON, Ariz. — Sophomore left-hander Brett Lilek did not allow an earned run for the second consecutive start and the Arizona State baseball team scored a pair of runs in the seventh inning to secure a 2-1 Territorial Cup win over Arizona on Friday night at Hi Corbett Field. 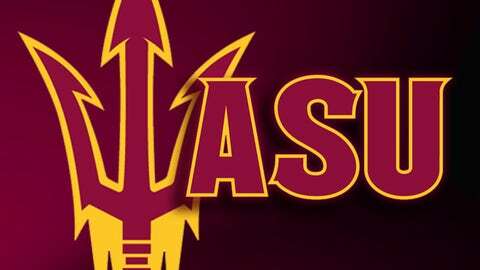 The Sun Devils (22-16, 11-8) took a 2-1 lead in the five-game Territorial Cup baseball series and ASU currently leads the overall Territorial Cup standings, 8.5-6.5, with five sports still undecided. Lilek (4-2) has not allowed an earned run in his past two starts, and four of his 10 starts this season, and has turned in three consecutive quality starts. He conceded just three hits and three walks to the Wildcats while striking out five, including the final batter he faced in the bottom of the seventh inning, to record his first win since March 14. The Wildcats (17-24, 6-13) broke open a scoreless tie with an unearned run in the bottom of the fourth inning to take a 1-0 lead, but ASU responded with a pair of runs in the top of the seventh to move ahead, 2-1. ASU loaded the bases in three consecutive innings before designated hitter RJ Ybarra drove home center fielder Johnny Sewald with a sacrifice fly to left field to knot the game at one apiece. UA pitcher Bobby Dalbec threw over to third base to appeal Sewald leaving early on the sacrifice, but his throw was off target and allowed shortstop Drew Stankiewicz to score the eventual game-winning run from second base. Right-hander Jordan Aboites worked himself out a bases-loaded jam with one out in the bottom of the eighth inning to keep the Devilsâ 2-1 advantage intact. UA left fielder Tyler Krause hit a ground ball back to Aboites, who made an acrobatic catch and threw the lead runner out at home, and freshman catcher Brian Serven turned the double play at first to end the frame. Right-hander Ryan Burr (9) allowed a leadoff single in the ninth inning but retired three consecutive Wildcats, including a double play to end the game, to record his ninth save of the season and the 21st of his career. Stankiewicz went 3-for-5 with a run scored and Sewald added a pair of hits to pace the Devils at the plate. UA shortstop Kevin Newman reached on a fielding error by ASU and advanced to third on a single and a sacrifice bunt before he scored on an RBI groundout by designated hitter Bobby Dalbec to give the Wildcats an early lead 1-0. Wildcats left-hander Cody Moffett (1-2) allowed a pair of runs on one hit in two innings to take the loss and starting right-hander James Farris tossed 4 1/3 scoreless frames.